Only 30.3 percent of tickets for next year’s Winter Olympic Games have been sold with less than four months to go until the start of Pyeongchang 2018, a sales update has revealed. The statistics, published by the Korean Herald, are likely to raise fresh concerns over the slow rate of sales, with the Opening Ceremony of the Winter Olympics due to take place on February 9. “We all need to take this situation seriously,” added Yoo. It was revealed that only 30.3 percent of the 1.07 million tickets organizers hope will be sold before the Games have been snapped up this far. 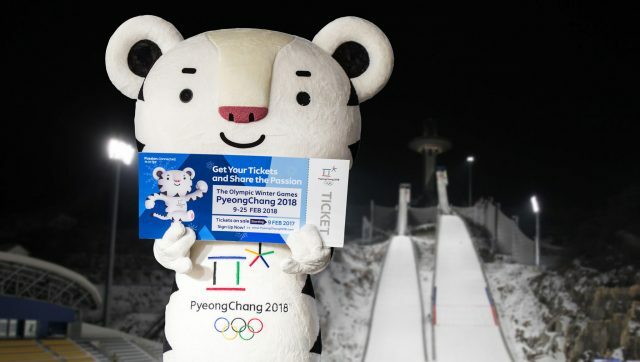 Pyeongchang 2018 claimed the 59.7 percent of the 320,000 tickets reserved for foreigners had been sold, but this figure includes those which have been distributed to the authorized ticket re-sellers in each competing country and it does not necessarily mean they have been bought. According to the Korean Herald, 17.2 percent of tickets for ice hockey, traditionally one of the most popular sports at the Winter Olympics, have been sold. South Korean President Moon Jae-in recently purchased tickets for the Games in a bid to increase sales, while the Korean Federation of Banks said they would buy $879,000 worth of tickets after the dismal figures were first revealed. The International Olympic Committee (IOC) claim they remain unconcerned by the low ticket sales, lowest in recent Winter Olympic history at this stage of preparations. “Sales continue to progress and Pyeongchang 2018 are confident that they will reach their ticketing targets given the ticket buying trends at other major events in Korea,” a spokesperson for the IOC told insidethegames. “We were presented with a promotional sales plan at the last Coordination Commission meeting and the expectation is that it will be delivered in full. “During the last Coordination Commission visit to Pyeongchang, we discussed with the Korean organizers a number of additional ideas to support ticket sales and these will be rolled-out over the next three months. Sales of Paralympic Games tickets are even more worryingly low as the update said only 4.2 percent of them have been purchased. “The International Paralympic Committee (IPC) has been repeatedly highlighting to the Pyeongchang 2018 Organizing Committee for a long period of time now the real need for them to increase engagement and awareness of next March’s Paralympic Winter Games,” an IPC spokesperson told insidethegames. “Next week we will be holding our final Project Review with the Organizing Committee ahead of the Games and the subject of ticket sales and engagement will certainly be high on the agenda. “While in South Korea we are also meeting with members of the National and Local Government to see what support they can offer in engaging the public in these Games. “We are also working with the Organizing Committee on a group sales program which should increase the number of ticket sales significantly. An update last month showed only 22.7 percent of tickets available for next year’s Winter Olympics had been purchased. Promotion has been frequently outlined by the IOC and IPC as a priority for organizers in the lead-up to the Games amid a perceived lack of interest. A Pyeongchang 2018 comment said: “With less than four months to the Games, locally we are focused on building up excitement and continue to engage the public to buy tickets for the Olympics and also the Paralympics. “Filling the stadiums is the goal and challenge of every Organizing Committee. “Internationally we want to continue to increase awareness of the Games so that people will want to be part of Pyeongchang either by coming to experience the Games in person or watching across a variety of platforms and channels around the world. “With the successful completion of 25 test event competitions, the overwhelming popularity of our volunteer program, the beginning of the domestic Torch Relay celebrating 100 days to go on November 1, and the medal unveils, we believe that excitement for the Games will continue to get stronger. No one wants to watch the Paralympics because Sport is meant to be a meritocracy – not a certificate of achievement for all participants.